Today, we continue talking about poblano chilies, mainly because I’m trying to find things to do with the sole survivors of my garden: poblano and jalapeno chilies. With so many chilies to harvest, I have to come up with uses for them. Sure, I could roast them, chop them up and throw them in the freezer for later use. This is a perfectly acceptable method for the preservation of garden abundance. But there’s this other thing you can do with chilies. You can stuff them. 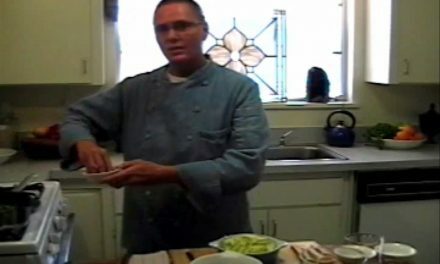 As a matter of fact, I made a little video that shows you how to do just that, roast, peel, and stuff a poblano chili. As a cook in the Southwest I’ve roasted my fair share of chilies. I’ve spent time at the prep table peeling them. Yeah, I make it look easy, and for the most part it is. It is also a bit time consuming. Getting involved in this project requires a couple hours of your time, but it is a rewarding and flavorful endeavor. Plus, if you make enough stuffed chilies, you can store them in the freezer for later when you really want some of that capsicum heat! Remember that if you aren’t used to handling chilies, you probably should wear gloves. 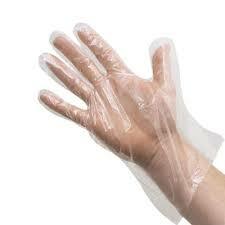 If you don’t wear gloves, wash your hands really well afterwards. The active chemical transfers to the skin and can be harmful if you rub your eyes or touch sensitive areas on the body. On to the stuffing part. My favorite stuffing for chilies is quinoa. It’s full of protein and vitamins and minerals that are really good for you. 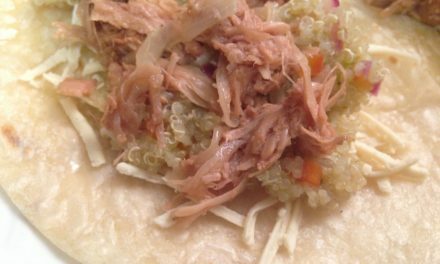 If you are eating a health conscious and/or plant-based diet, quinoa is probably already in your repertoire. 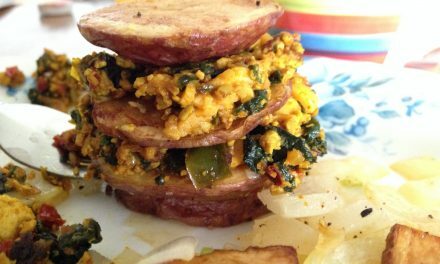 This is yet another fun and interesting way to incorporate it into your diet. Since this is a bit time consuming, get friends and family involved with roasting and cleaning the chilies with the promise of a robust and lively dinner. There’s all sorts of sides you can serve with these chilies. I’d recommend a sweet potato puree and stewed black beans. I’m including the recipe for the stuffing. 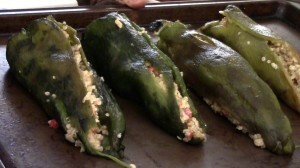 You can also watch the video on how to roast, clean, and stuff the chilies. Quinoa stuffing made with coconut milk, vegetables and spices for stuffing into Poblano Chilies. 8 Poblano Chilies, roasted and clean. Prepare all the vegetables. Heat up a large saute pan. Add the sunflower oil and wait until it gets hot. Add all the vegetables except the garlic to the hot oil, stirring so that they don’t stick to the pan. Saute for a couple of minutes. Add the garlic, coriander and cumin, continue to saute until the carrots soften up. Remove from the heat. Stir in the salt and cilantro. Combine with the quinoa. 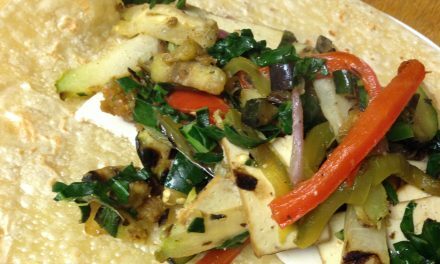 Fold in the tomatillo sauce, coconut milk and “cheese”. Set aside to cool. Prepare the poblano chilies by roasting them. You can broil them in the oven on a sheet pan or roast them on your grill. Watch the video below to learn how. Once the chilies are prepared, stuff with the quinoa. Bake in a 350 degree oven for 10-12 minutes. Top with cheese and put under the broiler for 2 minutes, or until the cheese melts. This is an outrageously tasty dish. 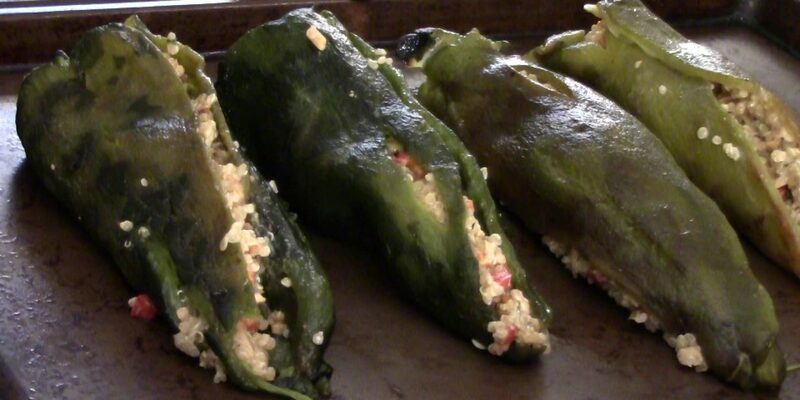 Take the stuffed chilies to a party and see how long they last. You can actually store the stuffed chilies in the freezer for several months, so make enough to have on hand when the chilies aren’t available.